Take a step in a new direction! Go beyond top-down or toe-up construction in New Directions in Sock Knitting. In the eighteen designs curated by knitting super star Ann Budd, you'll be treated to projects that range from traditional sock patterns to more challenging and innovative sock constructions. 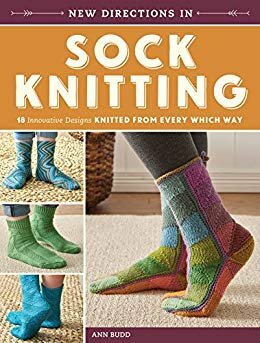 The socks in this collection use a variety of knitting techniques including double knitting, intarsia in the round, short-row shaping, mirrored color and texture patterns, and multi-directional knitting in both traditional and innovative ways. These techniques will have you casting on and knitting your socks from unexpected places--starting at the heel or sole or even from side to side! The instructions are all written in step-by-step detail that will ensure success, no matter which design you choose to knit.